Strikers march down a public street during the 1926 Passaic textile strike. 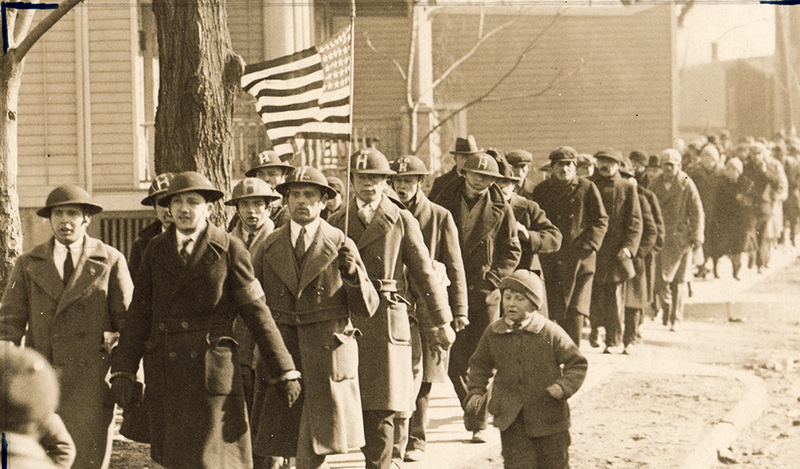 A group of strikers in front of the march wear World War I brodie helmets (doughboy helmets) and carry an American flag. A small boy runs along beside them. This work stoppage by more than 15,000 woolen mill workers in and around Passaic, New Jersey, lasted from January 25, 1926 to March 1, 1927. It was the first Communist-led work stoppage in the United States. “Strikers March, Passaic Textile Strike, 1926,” Social Welfare History Image Portal, accessed April 26, 2019, https://images.socialwelfare.library.vcu.edu/items/show/229.